In 1884, lumberman Charles H. King purchased 13,000 acres of San Lorenzo Rancho to grow wheat in the "Salinas Desert." At that time, no farming was done on a large scale. Eight-mule teams that hauled crops to Soledad, the terminus of the Southern Pacific Railroad. King's crop was successful. King's friend, Collis P. Huntington, the railroad magnate, proposed the extension of the Southern Pacific down the valley from Soledad. King gave Southern Pacific the right-of-way across his ranch. Today the line runs for eight straight miles over the old King ranch lands. The depot remained in operation until the 1980s when many of the Southern Pacific depots were sold or destroyed. 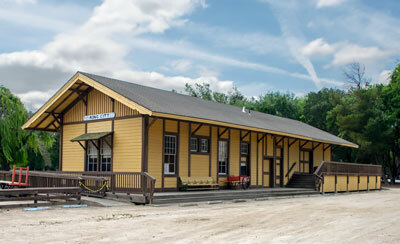 In 1989, the depot was moved to its present location and restored. The Southern Pacific Railroad played a key role in opening the Salinas Valley to settlement and agricultural development. Over twenty depots were scattered along its route through Monterey County but most have disappeared except for King City’s station.